SCOTTISH Liberal Democrat leader Willie Rennie is to seek to change his party’s rules to allow women-only shortlists for parliamentary selections. Mr Rennie said he had “lost patience” with the current system and would take steps to address the gender imbalance within his party at its spring conference. 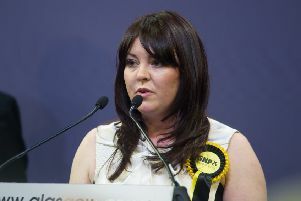 The party was criticised after its only female MSP, Alison McInnes, lost out to former MSP Mike Rumbles at the top of the party’s north-east Scotland regional list for next year’s Holyrood election. Similar proposals have been rejected by the party in the past but Mr Rennie said the time was right for a “fresh start”. He has pledged to lead a working group to look at measures to increase representation of Liberal Democrat women in Holyrood, Westminster and Brussels. Other options that will be considered by the group include quota systems and making gender a part of the party’s electoral strategy. Mr Rennie said encouragement and organisational support had been shown to be “insufficient to overcome the barriers to electing women”. He said: “I have lost patience with the current system and its inability to ensure proper representation of women. It is now time to take the necessary action to deliver change. “A fresh start for the Liberal Democrats requires us to change. We need to be more reflective of the people we seek to represent and to perform at our best we need to deploy our best people to make the case for our cause. “Despite an abundance of talented women, the party has been unable to put enough in positions to get elected. “It is difficult to make the case for opportunity for everyone when only one of our parliamentarians is a woman. “Twenty years ago my party agreed in the Constitutional Convention to work towards a gender balance in our Scottish Parliamentary representation. Mr Rennie said the intention would be for new arrangements to be in place for the European elections in 2019 and thereafter the 2020 general election and 2021 Scottish Parliamentary election. • Are female-only shortlists helping equality or not?